Bike Sale! All Linus Bikes are 20% Off! 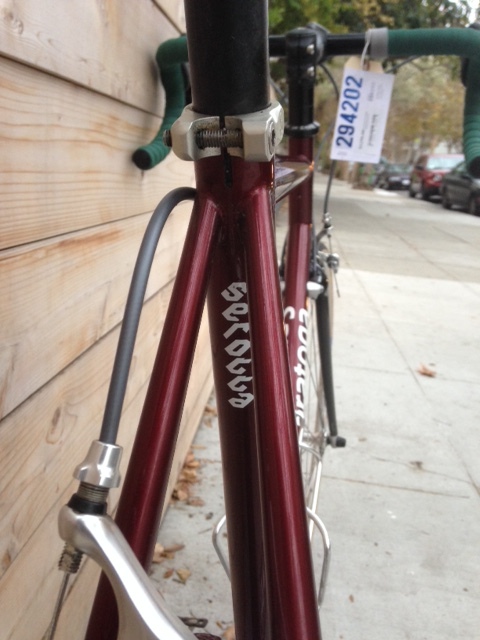 Some exciting news around these parts is that all models of Linus Bikes are on sale. That’s right, all Linus bikes are 20% right now. Pedal Revolution has pretty good inventory on a bunch of different models so come on by and find yourself a shiny new ride for the summer. We’ve got a nice Specialized that we’ve converted into a all-rounder, featuring a relatively upright riding position with Shimano bar end shifting. Most of the parts on this build are new, and if you’re into the color red and are looking for a comfortable do-it-all rig, this one could be a great fit for you. Cockpit set up with Soma Highway One handlebar, Shimano Aero levers, and Cinelli Bar tape. 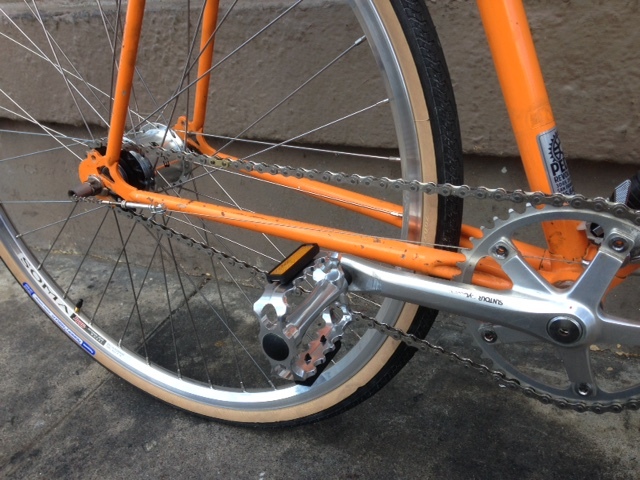 Cable Housing wrapped underneath the handlebars for an uncluttered look. Easy to run a handlebar bag, and plenty of space for cargo if you decide to add a front rack! This bike would be great for some long-distance touring too; the long chainstays are on par with a Surly Long Haul Trucker, and the bike’s solid enough to handle most anything you could throw at it. If you’re in the 5’4″ to 5″8″ range, come check it out today! Are you a smaller person looking for a good road bike? We have a nice 48cm Rocky Mountain with a Shimano 105 10-speed drivetrain, fresh bar wrap and a new pair of Continental Gatorskins. The bike is in like-new shape; like all of our refurbished bikes, it comes with a 3 month guarantee. 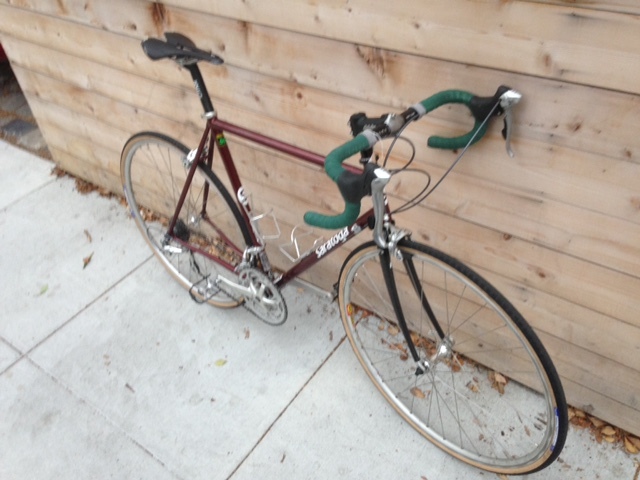 If you’re around 5′ tall and are looking for a good road bike, come check it out today! 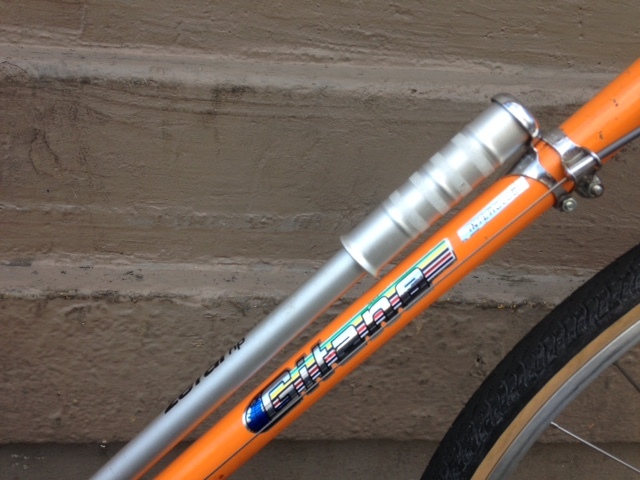 We’ve got a nice Cannondale for sale here at Pedal Rev. 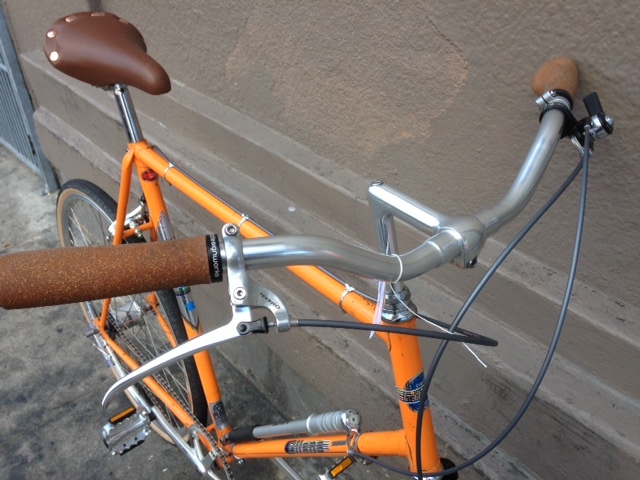 It’s got a Shimano 105 10-speed groupset, a quality lightweight wheelset, and some nice orange bar tape. The bike really hasn’t seen much use at all, as you can may tell from the below photos. We upgraded the tires (Gatorskin 700 x 25!!) and installed new Shimano cables and housing. The bike should be a good fit for somebody about 5’3″ to 5’6″. Come check it out today!! Though it may not be the Fourth of July, it was still Veterans’ Day yesterday, so even though it’s a day late what better time to post this finely refurbished Specialized road bike. For a long time this frame and fork resided in a dark corner of our upstairs storage area, but one particular morning this blogger saw it, cocked his head slightly with new-found interest, and brought it downstairs to be built up. A couple highlights of the build include a Chris King headset and a Dura-Ace 7700 crankset, both in very nice shape. The rest of the the build is Shimano Ultegra, and we’ve (again) modernized the cockpit with the short & shallow drop of the Soma Highway One handlebar. The opportunity for the ‘Merican color scheme was not grasped until the shift and brake cables were about to be installed, whereupon the builder seized on the opportunity with a sort of child-like glee. In hindsight, this excitement could hardly be described as nationalistic or political in nature; rather, it was merely in response to the synergy afforded by the color combination. This Specialized would be a good fit for someone between 5’9″ and 6”0′. Come give it a test ride today! 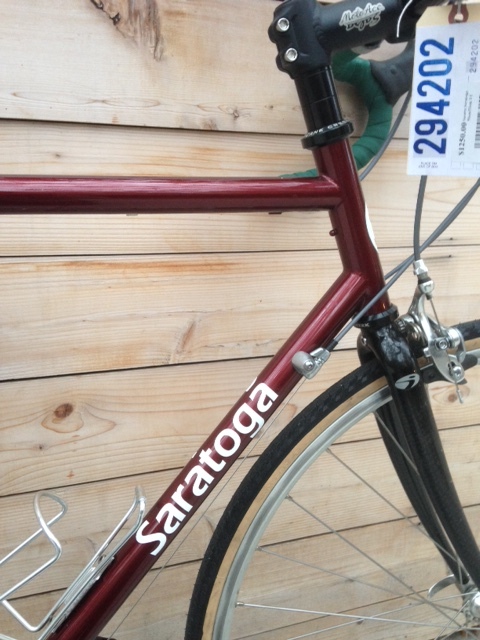 Bikes that bear the Serotta name belong to a long lineage of high-quality, American-made frames. The company was founded in 1972 by Ben Serotta and went on to provide frames for Olympians and Tour de France riders in the 1980s. As a relatively small-scale, artisan frame manufacturer, Serotta did some very interesting designs which can be read about in this article, published in Velo News. This particular one we have in stock, the Saratoga model, is perhaps the quintessential “mile crusher” that we love here at Pedal Revolution. It’s got a lightweight Reynolds 501 steel frame, a fork with some good steerer tube extension for a moderately upright riding position, and a Shimano 105 groupset in very nice condition. The wheels are also very nice–Shimano 105 hubs laced to Mavic Open Pro rims. 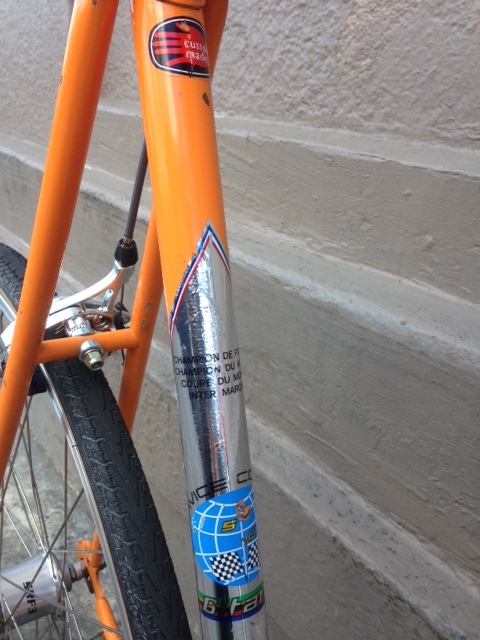 Good looking and riding hoops, and wrapped with the ubiquitous Panaracer Pasela tire. 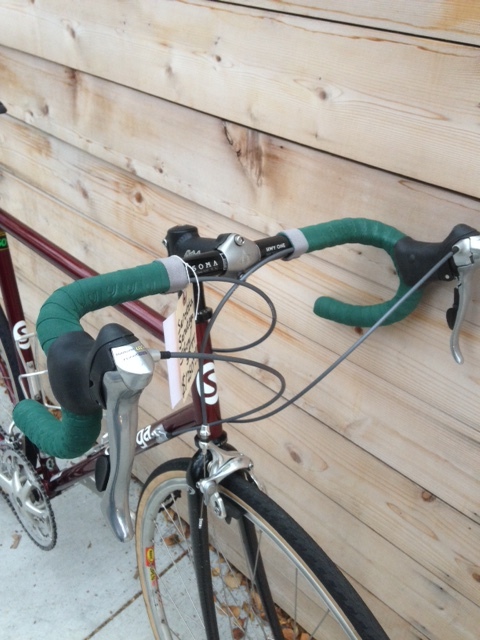 We’ve modernized the bike with a 42cm wide Soma Highway One handlebar and some cool Jaguar Racing Green handlebar tape, finished off with some grey Newbaum’s tape for a classic look. The bike weighs in at just over 23 lbs. A great fit for somebody in the 5’10” neighborhood. A quick and light road bike reconditioned and ready for the miles. Aluminum frame with carbon fork, wide-geared drivetrain to tackle the hills. 50cm – fits 5’2 – 5’5. last night was the longest night of the year. The sun set at 8:54pm and to celebrate all of the extra daylight the staff at Pedal Rev decided to go for a Sub 24 hour bike camping overnight. Otherwise known as an S240, the idea is that it isn’t always easy to get away for big trips, extended weekends, etc. but it’s not too tough to get out for a quick overnight, sleep under the stars and make it back to work the next day, albeit a little groggy. Touring bikes are a fine choice for this type of excursion accommodating racks and bags to facilitate bringing things like camping gear, food, coffee, frisbees, whiskey, bug spray, etc. Touring bikes are wonderful things but they are costly and there are other options out there if you dream of loading up a bike and venturing forth down the road for a little nature time. Older era Mountain bikes make for great budget touring bikes with their long wheelbases, rack mounts, steel frames,and sturdy construction. These can often be found used and modified to work as workhorse commuter bikes and yes, even touring bikes. Below is a fine example of a Pedal Revolution rebuilt Peugeot Canyon Express rigid mountain bike into a more utilitarian machine. Reinforced asphalt friendly tires matched to new wheels and a comfortable wide, upright handlebar make for steady cruising on street or dirt, in city or country. We have modified Surly Long Haul Truckers in just way for customers who preferred a more upright but still efficient ride. Come check this one out and get your ride on. A super utility vehicle is presented in this mini Surly Disc Trucker. 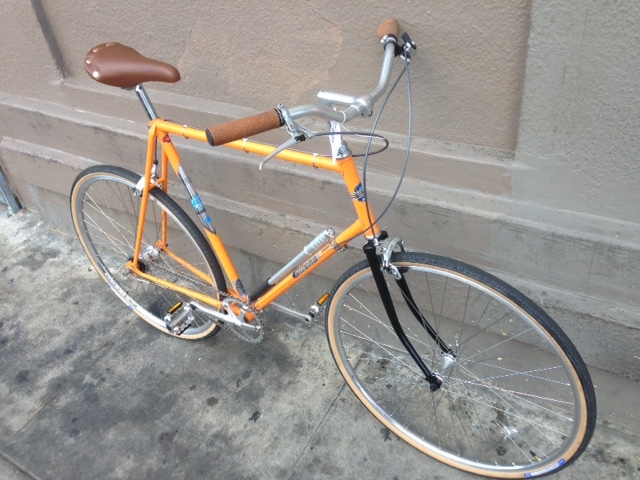 Our customer wanted a reliable touring bike to take her from California to Colorado. Upright riding position was key as well as carrying capability as she will be self-supported for the trip through various national parks. The 42cm Disc Trucker with 26″ wheels was a perfect match for her needs. This bike will do the job confidently over asphalt and dirt for miles and miles. When the next adventure is just beyond the horizon, a bicycle is fine choice to get you there.